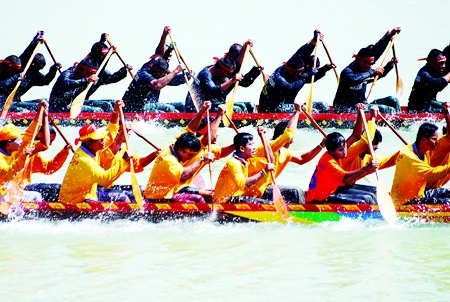 The 10th Pattaya International Longboat Race takes place this weekend at Mabprachan Reservoir. A joint collaboration between Pong Municipality, Chonburi PAO, Pattaya City, TAT Pattaya office and the private sector, the races will be held on Saturday and Sunday November 20 and 21. Experience the fun and excitement of Longboat racing at Pattaya’s Lake Mabprachan this weekend. Up for grabs is the HRH Princess Sirindhorn trophy and the HRH Princess Soamsawalee trophy. Some 30 boats have entered one of the three main categories, namely “big-long” 55 rowers, “small-long” 30 rowers and “international” 12 rowers. Countries participating this year include Cambodia, Taiwan, Macau, Burma, Vietnam, Thailand and Laos. Other fun activities include a long-drum competition for students and general public with all the fun starting at 9.00 a.m.